ON A RECENT Sunday the New York Times ran a long story headlined, “Waking Up to the Glut Economy.” A series of “graphics” preceding the text dramatized its major points: More of us are unemployed than in any pre-Reagan year since World War II; more downtown office space is vacant than in recent decades; there are excess supplies of oil and of most basic metals; our grain stocks have reached record levels; we have more computers than we know what to do with; despite billions said to have been spent on productivity, our trade balance continues to worsen; and we have the largest reserve of unused production capacity since the ’30s. Those facts certainly add up to what a layman thinks of when he uses the word “glut.” But I have a suspicion the headline writer had more than layman’s language in mind. For “glut” is a highly charged word in the history of economic thought. It was-given currency in 1803 by Jean- Baptiste Say (or his translator), of whom we’ve spoken several times before. The curious thing about Say is that he thought a universal glut impossible. My guess is that the headline writer was slyly calling attention to yet another failure of Say’s Law. I wish I thought the Times’ readers got the point. As John Kenneth Galbraith told us in American Capitalism, “Whether a man accepted or rejected Say’s Law was, until well into the 1930s, the test of whether he was qualified for the company of reputable scholars or should be dismissed as a monetary crank.” When Galbraith published the first edition of American Capitalism in 1952, the Great Depression was scarcely over a decade in the past, and everyone, even academic economists, knew a universal glut was possible. We were there. It had happened to us. It wasn’t funny. Although the quotations are from a book published in 1803, you will surely remember hearing similar sentiments from contemporary lips. The first might have been pronounced yesterday by Congressman Jack Kemp; the second by Federal Reserve Board Chairman Paul Volcker; and the third by Senator Gary Hart. Of course, it is nothing against these ideas that they are 183 years old. As Alfred North Whitehead said, all philosophy is a series of footnotes to Plato, and Plato wrote more than two millennia before Say. What is against these ideas is that they’re misconceived, mistaken, grievously misleading. There is a speck of plausibility in all of them, but only a speck. Over the past five years, however, they have made the rich very much more powerful (they were already as rich as need be). They have caused many millions to lose their jobs. They have forced many thousands of businesses into bankruptcy. And now they are going to be used to defeat many of the good provisions (such as they are) of House Ways and Means Committee Chairman Dan Rostenkowski‘s tax bill. Any rational discussion of these matters should start by recalling that there really and truly was a universal glut from 1929 to World War II. It should then go on to note that there is indeed a universal glut at present, too, just as the Times says. Say’s original error was characteristic of his times: He brushed aside the surface appearance of events and sought a hidden reality-what his contemporary Wordsworth called “something far more deeply interfused.” Therefore he easily convinced himself that money was a screen behind which real economic activity went on. “You say you only want money,” he wrote, “I say you want other commodities, and not money.” In a footnote he added, “Money, as money, has no other use than to buy with.” This sounds sensible enough (it is the speck of plausibility I mentioned), yet you have to be careful about the conclusions you draw from it. Say was not careful, nor are those who follow in his footsteps. Their careless reasoning goes like this: Since commodities are really bought with other commodities, the thing to do is to get commodities made. Perhaps some will prove to be unsalable; but unless an officious government jostles the unseen hand (Say was an admirer of Adam Smith), those who have produced commodities will immediately exchange them with each other, and everyone will live happily ever after. Modern econometricians have reduced this notion to a formula relating to the gross national product. Elementary textbooks define the GNP as the sum of personal consumption plus private investment plus government expenditures plus net exports. Since personal consumption and government expenditures seem purely passive (they seem to use things up, not to produce them), it is concluded that the way to increase the GNP must be to increase private investment and (if possible) net exports. As you can see, the conclusion fits in very snugly with Say’s Law. It also underwrites the views of supply siders like Jack Kemp, of people like Gary Hart who want to rebuild America, and of White House Chief of Staff Donald Regan, who wants to tax consumption. It was the justification for the tax credits introduced under President John F. Kennedy and for the rapid depreciation regulations introduced under President Ronald Reagan. It prompts lobbyists for big business to misrepresent Rostenkowski’s tax bill as a blueprint for depression. At this point a glimmer of common sense may give us pause. We already know that Say was wrong, that a universal glut is possible. We also know or should know-that we had a Jim Dandy depression (call it a recession if you want to kid yourself) from 1981 until well into 1983. And we know that depression was preceded by the Reagan tax law increasing investment tax credits and speeding up depreciation write offs. As a result, business’ share of the tax burden fell to 5.8 per cent-the lowest since the days of Herbert Hoover. Deserving companies like General Dynamics, in addition to paying no taxes at all, actually got hundreds of millions of dollars in rebates. The fact that the depression of 1981-83 followed the 1981 tax breaks for big business may not be conclusive proof that the tax breaks caused the depression (it is post hoc, not necessarily propter hoc), but it is sure as shooting proof they didn’t cause prosperity. Moreover, the highly touted business recovery of 1983- 84 followed the 1982 tax law, taking back some of the earlier giveaways. This being the empirical record, it is at best quixotic to pretend that rescinding a few more of the tax breaks, as in the Rostenkowski bill, would bring on another recession. It is more than quixotic. I’ll compromise my reputation for mildness and say that it is illogical, devious and mischievous. NOWLOOK BACK at the components of the GNP, in particular at personal consumption and government expenditures. These seem purely passive, but of course they aren’t. 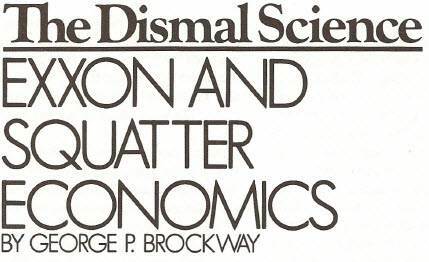 Quite apart from the fact that consumption is a human activity (note the syllable “act”), not a galvanic reaction, there are two sides to consumption, as there are two sides to everything in this double-entry world (see “The Chicken and the Egg,” NL, September 9, 1985). Nothing can be consumed unless it has been produced. But isn’t that what Say said? No, it is almost the diametric opposite. Say and his followers claim that whatever is produced will be consumed (hence no glut is possible). What we are claiming is merely that whatever is consumed must have been produced. There is no way to consume more than has been produced; it is very easy to produce more than will be consumed. Every businessman knows this. It would be no great trick for Harper and Row to turn out 10 million (why not more?) copies of my book; they are timid, though, and fear they might not be able to sell them all. Even Say couldn’t avoid recognizing a further weakness of his Law. “There is nothing,” he wrote, “to be got by dealing with people who have nothing to pay.” In short, some products are not consumed because people don’t want them, and some because people can’t afford them. In either case, producing more won’t solve the problem. To put it another way: You can’t dissolve a glut by producing more of what you already have. One of the great contributions of John Maynard Keynes-possibly the greatest-was his demonstration that in a capitalist system (or in any system that is advanced much beyond bare subsistence) glut is not only possible, it is always imminent. This is because of what he called “liquidity preference,” which is partly a function of the necessity to have assets (mainly money) on hand for daily needs and partly a function of our inevitable uncertainty about the future, leading us to keep assets readily available to guard against (or to exploit) the unexpected. Everyone (except those who have no money at all) exhibits some preference for liquidity, the very rich probably more than the rest. Whatever is kept liquid is neither consumed nor invested. It is withheld from the economy, making it impossible for the economy to buy and pay for everything it produces; hence a glut. Some sort of glut is inevitable; the problem is to keep it manageable. There are two principles guiding glut management: The first and (assuming the brotherhood of man) most important is to take steps to increase the purchasing power of the poor. The second is to make intelligent use of the purchasing power of the government (see “All You Need to Know about the Deficit,” NL, October 29, 1984). Reaganomics has violated both principles. The Rostenkowski tax bill is a very modest attempt at correction. Gluttonous conservatives don’t like it because it deprives a few of the rich of a few of their recent benefits and re-imposes some taxes on corporations. The claim is the altogether smelly canard that incentives will be sapped if the rich and prosperous are asked to pay their share of the taxes. Equally disgusting and stupid is the attempt, in the face of a glutted economy, to “balance” the budget and thus reduce government expenditures at the very moment they should be expanded. 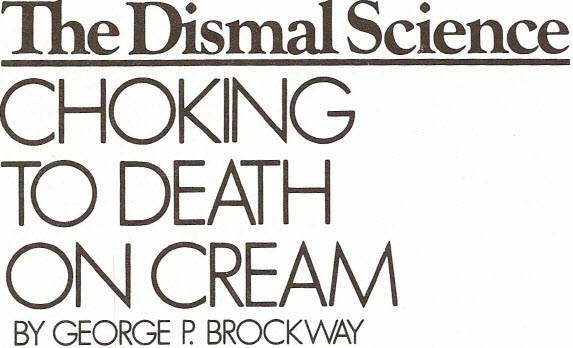 There may be other ways to kill a cat, but choking it to death on cream may prove sufficient.